We received the hard cover copy of last year’s posts. My wife always likes to have a paper copy of our blog in her hands as something substantial and tangible to represent our interests in cooking (and eating). As usual, this one is from blog2print. 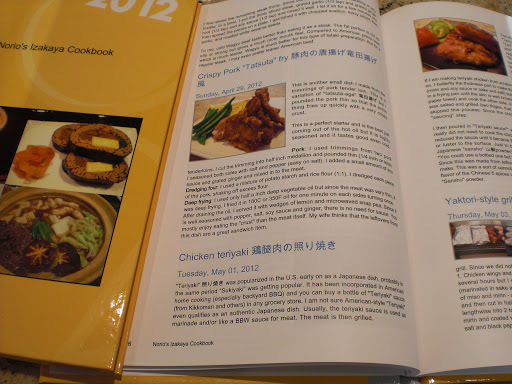 I posted a link in the NOWF Cookbooks tab for the PDF version if somebody is interested in browsing through the pages. As you notice, after several years of doing this post, I am running out of ideas and non-izakaya food is creeping in more often. This is something totally different from what I do for a living and gives me some diversion, so we will try to keep doing this as long as we can. Finally, our blog cookbooks are here!